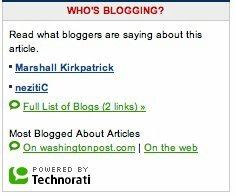 I found this article written by Marshall Kirkpatrick to be very interesting. It is just another example of how blogs are working their way into all the things we think of as our traditional media. The Washington Post is now using a two pronged approach to get full coverage of its news stories. For those of you who are still wondering just what a blog is or if it is something meaningful, this is just another example of the power of Blogs.